Last week I went back to my home in the Netherlands to celebrate Dutch Christmas, Sinterklaas (St. Nicholas). A cousin (of sorts) to Santa Claus, the Sint is a tall man with a long white beard, dressed in a papal-style red cassock and pointy hat, and carrying a curly gold cane. He arrives on a steamship from Spain in Mid-November and stays till the 5th December. It seems that Sinterklaas is based on St. Nicolaus, the Bishop of Mira in Turkey, who was known for his kindness to children. The Sint rides a white horse (who can, rather mysteriously, climb up onto rooftops) but it is his helpers that do most of the sweet-giving. These zwarte Pieten (black Petes) hand out sweets, mostly spiced biscuits, from sacks to the eager crowds of children. These Petes are usually Caucasian Dutch people with black face paint, red lipstick, an afro wig and brightly coloured Renaissance style clothing. 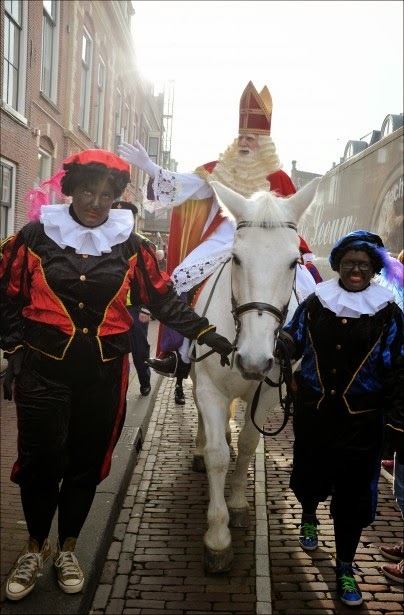 In the past few months great controversy (and animosity) has been generated by a nationwide debate on whether zwarte Pieten are racist, and if so, how the holiday should be altered. To any outsider the description I gave above of zwarte Pieten refers to history of racism, that has incorporated along the way elements of the Netherland’s colonial history – black slaves arrive from ships carrying spices at the behest of an authoritarian figure who towers above them on his horse. In songs the Pieten are regularly referred to as ‘knechten’ meaning servants – so their position in the power dynamic cannot be misunderstood, even if the term slavery can be debated, as, with all traditions, Sinterklaas has many possible origins and mutations. The Pieten, who behave like naughty children, are also dressed in slave-children clothing, as was persuasively argued by Michiel Kruijt using paintings as evidence from the 17th century onwards in Dutch newspaper the Volkskrant. What surprised me most is the strong hold tradition has over and above, not only empathy, but any concept of history. 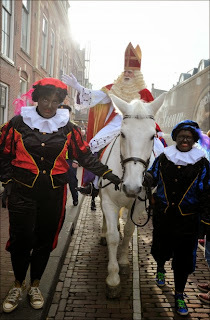 For a country that prides themselves on tolerance and multiculturalism, many Dutch people delude themselves by claiming that zwarte Piet is merely ‘black from climbing down the Chimney.’ It’s fun to watch their face drop when you point out afro hairstyles and painted red lips are not common features of Victorian chimney sweeps. Not only is blacking up incredibly inappropriate in a multicultural society that should not discriminate, it is also a celebration of a past in which people of non-Caucasian origin have suffered from exploitation by European powers. How can tradition be exalted when it harks back to the very worst parts of Dutch history? If national identity were secure, the swapping of black facepaint for another colour, would not engender such outrage. If you scratch beneath the surface of the Sinterklaas-purists you find insecurity about the nationalism. In their intractable desire to cling onto Sinterklaas’ tradition wholesale, the purists perversely push to the forefront the dark past of their nation and, much worse, engender violence and racism in the here and now on those Dutch citizens and immigrants who want to be feel part of their nation. For those who defend zwarte Piet, it’s time to realise that people have chosen to make Holland their home and that its therefore the duty of the average Dutchman to make them feel welcome, especially through Dutch traditions. By doing so they’ll really bolster Dutch nationalism much more than hanging onto the darkest of Dutch traditions.